can also be used for acrylics. Available in short and long handle packs. Contains Round 3 & 6 • Filbert 3 & 6 • Flat 10 & 14. The Winsor & Newton Foundation™ range provides an introductory selection of good quality brushes for students, hobbyists and beginners. These oil brushes are available in a choice of packs, which contain various sized brushes, in round or flat or shapes. Round brushes provide excellent control and are good for lines and detail work. Filberts are idea for broad strokes with a soft edge. Flat brushes are excellent for bold, sweeping strokes and the edge can also be used for line work. 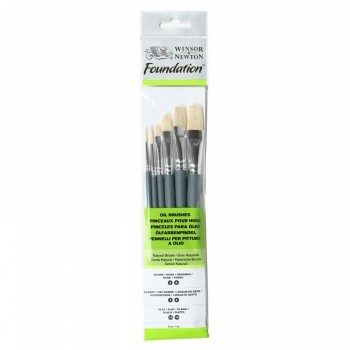 All Foundation™ oil brushes are made from white synthetic filament, which is ideal for working in oil colour.